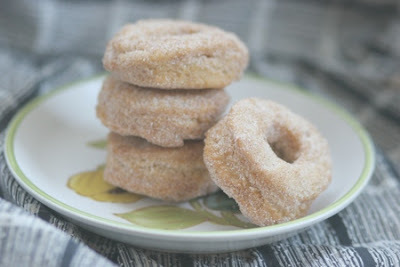 cardigans and kids: Saturday Morning Special - doughnuts! Saturday Morning Special - doughnuts! adapted just a bit from "Baked Explorations"
in a large mixing bowl, whisk the following dry ingredients. * you are also going to need vegetable oil for frying. Make a well in the center of the flour mixture and then pour the wet ingredients into the well. Mix until the dough is combined and smooth. Lightly flour the countertop, turn the dough out onto, sift a bit more flour over the dough and then using the palms of your hands, flatten the dough out so it is about 1/2 inch thick. Using a 2 or 3 in. doughnut cutter, cut out the doughnuts. Place them on a baking sheet lined with parchment paper. Refrigerate while you wait for your oil to heat up. As you wait for the oil to heat up. You can mix 1 1/4 cups granulated sugar with 3 tablespoons cinnamon together for the topping. If you want to try a vanilla glaze, mix 2 cups powdered sugar with 1/4 c. milk, and 1 teaspoon vanilla. Note: if you make both glazes, you may want to reduce the batch size by half so you don't end up with a lot left over. Enjoy! They are best fresh, so if you have more enough for you and your family you may see if a neighbor still has some coffee brewing to share with.